Much experimentation has been conducted to attempt to change the color of insulators through heating, either to create new and unusual colors or to duplicate colors with higher value than the original specimen. While sustained exposure to the high temperatures of self-cleaning ovens may work on some pieces, the most common practice is the use of a standard ceramic hobby kiln. 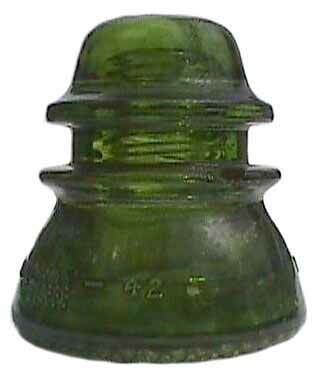 The results of this practice are most visible in the "CALIFORNIA" and "CGI Co" embossed insulators. The application of heat turns purple California's to yellow and some greens to yellow green. While numerous California yellows have been authenticated by their finders, there is more than ample evidence that many yellow specimens have been artificially heated to achieve their color. There is no reliable test to determine whether an insulator’s color has been altered by heat. If there is evidence of overheating (see section 3 on Mechanical Alterations) there is a strong probability that the color has been likewise altered. The problem with some heated pieces, however, is that when the temperature is carefully controlled, the piece may show none of the signs of cooking described under Section 3. So, how do you tell the real from the fake ? You can't ... only the baker knows. There are a number of commercially available glass dyes which are legitimately used for a variety of purposes. Insulator alteration, however, is not one of them. There is even a dye available which gives the appearance of carnival glass upon heating but which yields to some of the above tests. 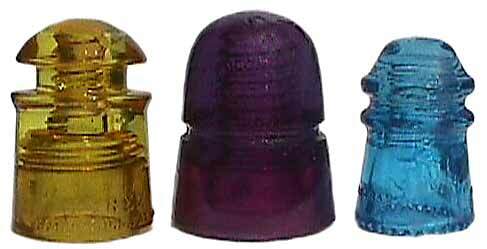 There are a number of ways to identify dyed insulators. 1) Uneven Application. Many dyes are very difficult to apply evenly. Close examination will normally reveal streaks, runs, dried drips, thin spots, bubbles, lack of coverage, etc. Many interior surfaces of the piece reveal the same symptoms of tampering. The clear Hemingray CD 154 has been dyed deep yellow green. The dye, however, is unevenly applied and shows as dark and light areas all over the insulator. 2) Color Not Listed in Literature. 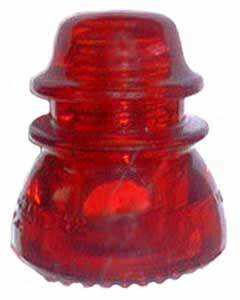 While no reference is perfect, McDougald's books and price guides are extremely reliable in identifying known colors of insulators. The authors went to great pains to authenticate colors before listing them in the books. If you find a piece with a brilliant or unusual color and it isn't listed in the literature, it is a good candidate for either the fake farm or find of the year! The specimens in these photos are not found in the literature in these colors. The quality of some is so good as to defy detection short of scraping the surface. The common and "classic" Red Hemingray-42. The red painting was applied to a clear insulator. 3) Ease of Removal. When a coating can be removed easily by simple cleaning or light scratching it is probably not factory applied as in the case of carnivals and flashed ambers. Beware, however, that even authentic coatings can be removed through severe abrasion, acid and other chemicals, and through constant exposure to severe natural elements. The process used in the creation of "Carnival Glass" (also known as "iridescent" glass) coloration consists of the application of a metallic oxide to the surface of the glass which becomes a part of the surface through subsequent annealing or reheating of the glass. This set includes a CD 257 Hemingray, a CD 107 Whitall Tatum and a CD 128 Pyrex. The 257's are commonly found but are all altered. The other two are much scarcer. The 128 Pyrex was created using a dye referred to in the previous section. This trio includes a CD 251 and 218 Hemingray (L&R) and a CD 152 California in the center. 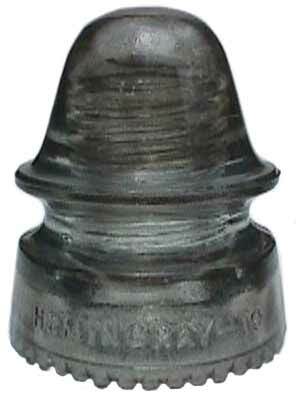 California insulators were made a couple decades before the first factory carnival specimens and there is no evidence that either Hemingray was made by the factory in carnival. The CD 203 clear Armstrong and aqua CD 122 Hemingray insulators were treated with ceramic glaze compounds to produce gold and black carnival colors respectively. When a scarce carnival factory specimen is reproduced artificially, it threatens the integrity and value of every authentic carnival piece in existence. There is a strong belief that valuable carnival specimens have been manufactured in the last 20 years, some in substantial quantities. The most suspect specimens are Hemingray CD's 154, 162, 164, 168, and 230 and Pyrex specimens in CD's 128, 233, 234, 235 and 320. In addition, a "silver carnival" coating has been reported on some Hemingray CD 162 specimens. This effect, however, can be created by using a wire buffing wheel to apply aluminum to the surface of glass. This CD 162 Hemingray was buffed with a wire wheel containing aluminum to produce a silvery sheen. Artificial carnival detection is extremely difficult and sometimes impossible. The most certain way is to learn which of the CD's and brands were not manufactured in carnival colors. Beyond that, only the most careful scrutiny will assist and, at best, it is only occasionally successful. 1) Chipping and wire rubs. 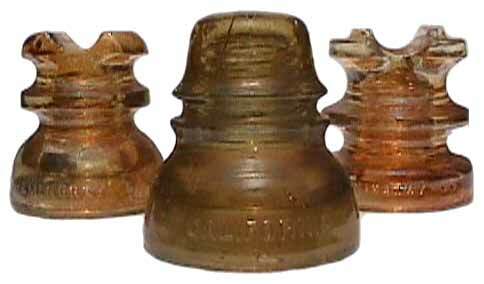 During the factory processing of carnival insulators the hot pieces went from the mold to the annealing process and had little or no opportunity to sustain damage of any type. Damage or wear of any type just about had to be sustained after production and as a result of installation, normal wear and tear, and removal. When inspecting a suspected artificial carnival, check for any sign of wear or damage including tiny pings, chips, flakes, rub marks, etc. If an authentic carnival has sustained any of the above, the affected area will show clean, clear glass at the point of damage. The carnival coating will be missing. In pieces which have been artificially altered, any such damage or wear will have the carnival coating on top of the damage or wear. This is a strong indicator that an insulator which was installed and used in clear color has been altered. Even the tiniest ping, flake, or chip can reveal a fake carnival insulator. If the insulator is not damaged or worn, however, this technique will not be effective in spotting the fraud. 2) Coloration Patterns. Many of the authentic carnival Hemingray styles were marked by a rather "washed-out" appearance when compared to the brilliant gold's and dark orange of Pyrex specimens. While there is plenty of evidence to suggest that some Hemingray styles were deeply colored, there is equal or greater evidence which suggests that some brilliant Hemingray colors are artificial. The solution used to iridize Hemingray items was chemically different than that used by Pyrex, making Hemingray carnival inherently less intensely colored. There has been information presented over the years that the coating of Hemingray specimens occurred by spraying the metallic coating from the bottom of the insulator up. This is supported by the CD #'s 118, 142, and 142.4, which are characterized by carnival skirts and clear domes. This is inconsistent with other specimens which have deeply colored domes. It is undetermined whether Hemingray used different application techniques with different CD styles but questions do exist as to why there is such a difference between the deeply colored items and the lighter ones. In any event, when evaluating the deeply colored Hemingray carnivals, a high degree of caution must be exercised. In the case of Pyrex specimens, there was generally little suspicion about the authenticity of carnival specimens until the late 1980's. A number of pieces have been seen since then which bore the signs of artificial carnival coating. Until supplies of authentic pieces dried up, it was not financially practical to alter Pyrex pieces. With higher prices in the market, however, this may no longer be the case and the possibility of frauds is substantially increased. 3) Soot and dirt. Many authentic carnival pieces were used adjacent to railroad routes and were, as a result, prone to accumulation of coatings of soot from locomotive exhaust. These coatings are often quite difficult to remove. When a piece is acquired with soot deposits, it tends to add credibility to the piece's claim of authenticity. While certainly not absolute evidence, it is another tool to help in the identification process. 4) Dump specimens. Many specimens of Hemingray carnival's were found in the factory dump. Many of these specimens display the characteristic etching of buried specimens and at least some damage consistent with being dumped. Both are possible clues to establishing authenticity. 5) Styles. It is generally presented that any Hemingray specimen with a corrugated base was not made in carnival by the factory as that style is much newer than those made during the carnival "era". Authentic "carnival" was produced by Hemingray predominantly during the period 1932-1936. Pieces produced much thereafter must be suspect. There are some known carnival specimens of newer styles alleged to be authentic but indications are that they are samples or were only experimental and were not mass produced for sale. This includes CD's 137, 155, 160, 214, and perhaps 257. With any such specimen the utmost caution must be exercised as authentication would be nearly impossible beyond the first generation of owner. 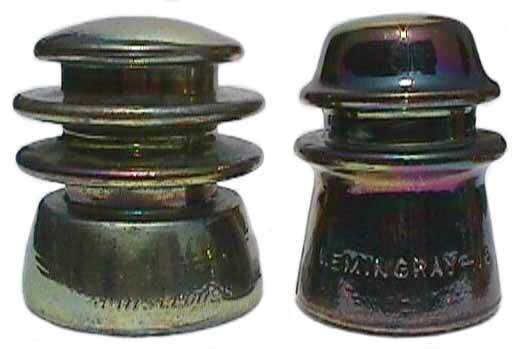 In all cases, despite the use of known techniques to authenticate carnival insulators, extreme caution must be exercised in the investment of significant amounts in the more costly carnival specimens unless their authenticity can be established to your satisfaction. 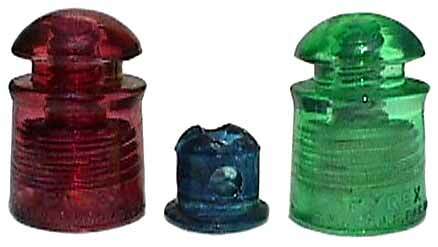 A number of different efforts were made to alter insulator color using devices which reacted with the glass upon exposure. This includes Cobalt-60 medical radiation, linear accelerators and other experimental scientific devices, and various X-ray machines. 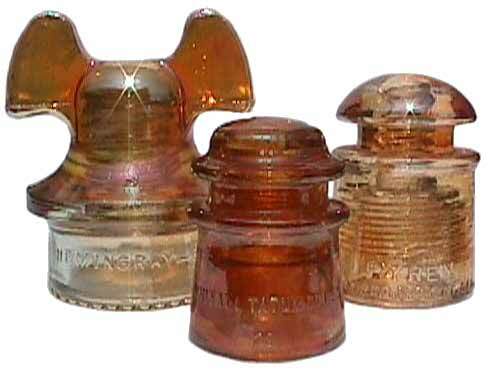 Insulators exposed to any such device are referred to as "irradiated." 2) Detection. Other than experience with known and artificial colors, and reference to the literature, there are no external methods to identify irradiated pieces. Heating and/or exposure to the sun causes some irradiated pieces to return to their original colors but the conversion is often times only partial and may be very slow. This is not known to work in all cases and dependence on others knowledge may be the only reliable method to identify irradiation.